Hanger Shaped Paperclips – Genius! | OhGizmo! Hanger Shaped Paperclips – Genius! 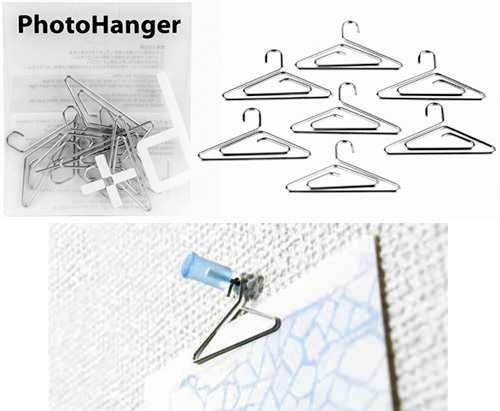 While $9.50 is a heck of a lot to pay for just 7 pieces of twisted steel wire, these clever PhotoHangers make it particularly easy to show off photos, postcards or anything worth displaying by hanging on a tack stuck to a corkboard. They also work just like regular paperclips, though something tells me given their premium pricing you won’t be so quick to use one on a TPS report you’re just going to give away. Available from arango. Wow. I bend paper clips into hangers all the time in highschool and college when I'm board in class. I never even thought about keeping the “paper clip” aspect of it. My oh my, why on earth I haven’t thought of this before. This is very useful since we don’t have to punch a hole on the paper just to put this on the corkboard.